Why She's Amazing: Because her French-inspired, farm-driven cooking is simple yet extraordinarily delicious. 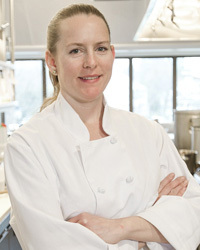 How She Learned To Cook: "Definitely through on-the-job training and personal research. I read a lot, especially comprehensive technique books." Cooking with the Seasons: For two to three weeks in August, Johnson features a corn-and-tomatoes tasting menu that includes dishes like chilled corn custard with tomatoes and parmesan tuile. For dessert: warm corn pudding with blueberries, lemon verbena ice cream and caramel popcorn.